Coming into the 2018-2019 school year, no one could have foreseen the amount of athletic success that was about to take campus by storm. From women’s soccer winning another Centennial Conference Championship and earning a trip to the Sweet 16, to Men’s Swimming winning a Centennial Conference Championship, to Men’s Basketball not only winning a Centennial Conference Championship, but playing in the Division III National Title Game, this school year has yet to find a season where campus-wide excitement for a sport team’s success is lacking. Although it is still relatively early in the season, the spring sports appear to be continuing this success. Both Men’s and Women’s Lacrosse are off to 6-0 starts. For the men’s team, this is their first 6-0 start since 2000, and the women have not been 6-0 to start a season since 2014. Both teams have been absolutely dominant during this stretch also. The men have won by an average of 7.8 goals per game, while the women have won by an incredible average of 10.8 goals per game. This improvement is coming into fruition shown even while the Garnet are still trying to finalize rotations before conference play. “Although the lineup has changed from game to game, the defense continues to make stops while forcing opposing offenses into low angle shots,” states Gress. “The offense is averaging 45 shots per game and passing the ball very well with over 60 percent of goals being assisted.” With 60 percent of the goals being assisted, the team is clearly playing unselfishly and together. Having a team that plays together and for each other is not only a reflection of the coaches, but also its leaders. Every great team has had great leaders, and this year’s Men’s Lacrosse team certainly has that. The Garnet are led by senior captains Thomas Ferguson, Dylan Rittenhouse, and Christian Vik. Ferguson, an extremely tough, absolute grinder of a defensive midfielder from Reading, PA, has credited much of the success to the hard work the team put in during the offseason. “I attribute this year’s success to my teammates’ commitment to the off-season program,” Ferguson said. “Lacrosse is a year-around commitment and you need to be focused on your end goal starting day one of fall ball. Chris and Michelle, our strength coaches, have gotten us into great shape and its really starting to show as the season progresses.” This great shape has certainly shown, as the team has scored almost 60 percent of its goals in the second half of games. 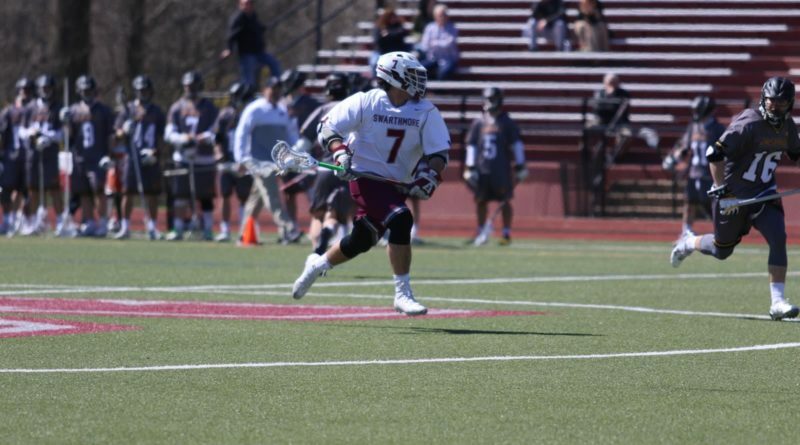 When the opposing team is tired, Swarthmore men’s lacrosse still seems to have a lot left in the tank. As for the women, they have beaten Immaculata University, Arcadia University, Widener University, the University of Lynchburg, Piedmont College, and Eastern University. The Garnet are led by captains Tess Wild, Kathryn Restrepo, and Elizabeth Wainwright, and head Coach Karen Borbee. The current points leader for the team is Senior Kathryn Restrepo with 25 points, followed closely by fellow Senior Tess Wild with 22 points. The defense in anchored by goalie Betsy Cohen, who earned Conference Defensive Player of the week a few weeks ago for her stellar performances. “The team has been successful so far because we have a lot of energy,” said Ostrowski. “When our seniors began playing at Swarthmore the team was barely providing enough players to play a game. Now we have more numbers and our bench is much deeper. With this larger team, we have a lot of energy and excitement that has helped keep everyone focused and working hard.” This depth and energy certainly is providing the team a lot of confidence going into conference play. Conference play starts this upcoming weekend for both the men and women as they each take on Franklin and Marshall College at home. Both players and coaches are excited for the conference season, as the Centennial Conference is one of the best conferences in the country for both men and women. Gettysburg women’s lacrosse team won last year’s national championship, and four Centennial Conference men’s teams are ranked one of the top twenty (three in the top ten) teams in the country. It’s safe to say the Centennial Conference is tough. 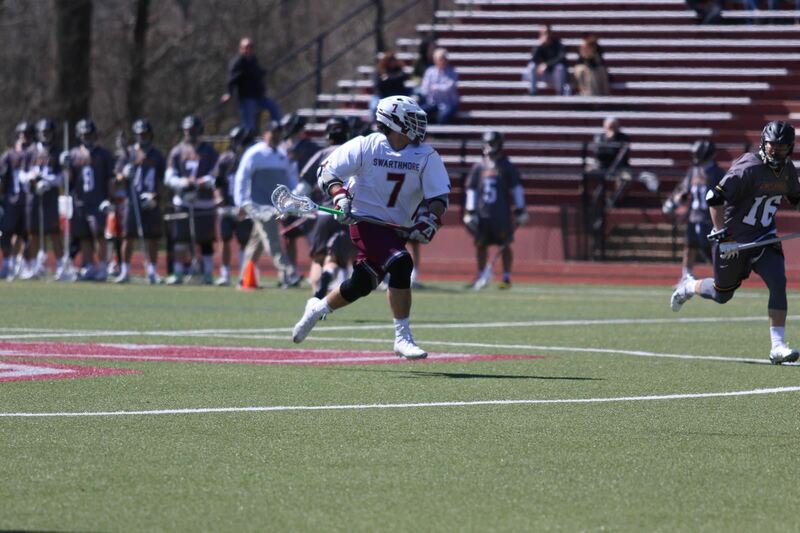 The spring should be and exciting time for the sports teams at Swarthmore. Many games will be won and a few will probably be lost, even though losing does not seem to be in Swarthmore DNA recently. However, both teams have lofty, but certainly achievable, goals, especially considering this year’s success.